Bushfires raging out of control on the outskirts of Perth in Western Australia have destroyed at least 59 homes. Firefighters are battling blazes to the east and north of the city, with the area declared a natural disaster zone. High flames are being whipped up by winds of up to 70km/h (44mph). Hundreds of people have left their homes. The blazes come exactly two years after 173 people died in bushfires that swept through the southern state of Victoria, causing widespread devastation. More than 100 firefighters are battling from the ground and air to contain the fires that are burning out of control in the bush-fringed suburbs of Perth. Swirling flames reported to be up to 3m (9ft) high have engulfed 59 houses and damaged nearly 30 more. The weather forecast is for hot, gusty winds that will make the fires even more dangerous and unpredictable. Emergency chief Craig Hynes said there had been no serious injuries or fatalities. He said officials were prepared for the "remarkable" winds, but added that the fires were yet to be brought under control. "Life is our priority," he said. The Western Australian government has declared the area a natural disaster zone and has promised to provide financial assistance to the affected families. Hundreds of residents have spent a nervous night in evacuation centres not knowing if their properties have been spared. Lionel Goodall fought the blaze as long as he could as it raced towards his house. "All the backyard is gone; it is all just black and smoke," he told the BBC. "All the fences were alight so I just got my hose out and started putting all the fires out and in my next door neighbour's yard as well... We've got farmland behind us with short grass and it was very, very quick." Many of the people in evacuation centres were still in a state of shock. A resident from Roleystone, one of the worst-hit areas, who gave her name as Sylvia, told of her fear as the fires approached. "We've had fires lots of years but we've never been evacuated before. "You can't be as efficient as you want to be when you are panicking and things like that. You can't see the phone number in the phone book properly when you are panicking. "I was staying calm on the outside but scared stiff on the inside," she told ABC news. 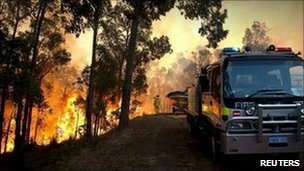 The BBC's Nick Bryant in Sydney says fire investigators have dispelled fears of arson, a common cause of bushfires, and believe that one of the blazes was caused by sparks from a power tool. There seems to be no end to Australia's summer of disasters, our correspondent says. The fires near Perth follow major flooding in Queensland and Victoria that claimed the lives of more than 30 people. Towns on the north-east coast of the country are continuing to clean up after last week's Cyclone Yasi - a category five storm - the most severe level - which destroyed hundreds of buildings and valuable crops. The army is leading the recovery effort there, with bulldozers, cranes and tanks brought in on Monday to help move mountains of debris. Sheesh, Australia is really getting hit from all sides by Mother Nature this year. How is the economy there holding up under all these extra expenses? Cyclones, floods & now bushfires in WA! From the east coast to the west coast now! How is the economy holding up? I think we are keeping our heads above water, (courtesy of the mineral export boom to Asian countries, mainly), but who knows what the exact situation is? Not me. The costs keep growing, escalating like topsy, with each new disaster! There is a new tax proposed by the federal government (& opposed by the opposition party) to pay for the extensive flood damage in Queensland. I'm not certain if this will accommodate the cyclone damage there, too, but I'd suspect so. And as for the rest ? I have a feeling that someone else, maybe closer to some the affected areas, maybe able to give you a better idea. If not, I'll do a bit of research & try & find out. But ... what a weird summer it's been in Oz!